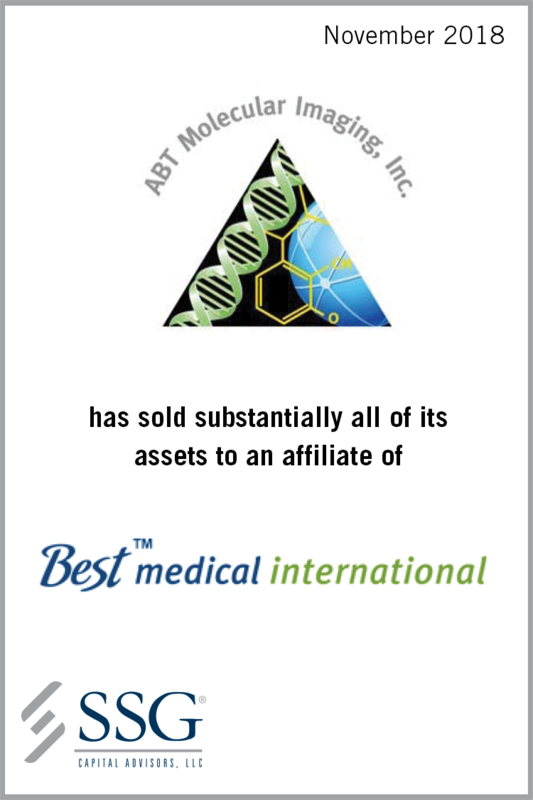 SSG Capital Advisors, LLC (“SSG”) acted as the investment banker to ABT Molecular Imaging, Inc. (“ABT” or the “Company”) in the sale of substantially all of its assets to an affiliate of Best Medical International, Inc. (“Best”). The sale was effectuated through a Chapter 11 Section 363 process in the U.S. Bankruptcy Court for the District of Delaware. The transaction closed in November 2018. Based in Knoxville, Tennessee, ABT manufactures the BG-75 Biomarker Generator (“BG-75”), a small-footprint cyclotron that produces unit doses of molecular imaging drugs for positron emission tomography (“PET”). The BG-75 is a self-contained system that enables a single user to produce PET biomarkers on site and on demand without the need for preexisting or in-depth PET radiochemistry or particle accelerator expertise. With global sales and support personnel, the Company primarily targets scientific or academic research centers in developed markets as well as emerging markets where access to the short-lived radioisotopes necessary for PET imaging is costly and limited or non-existent. Despite receiving 25 BG-75 orders since 2011, ABT faced continued liquidity challenges due to shifting healthcare dynamics in emerging markets. As a result, the Company was forced to curb critical marketing investments and other operating initiatives. To properly capitalize the business and pursue an attractive pipeline of near-term sale opportunities, the Company retained SSG as its exclusive investment banker to assist in the exploration of strategic alternatives. To effectuate a transaction, ABT filed for Chapter 11 bankruptcy protection in the District of Delaware in June 2018. SSG conducted a comprehensive marketing process to an international universe of strategic and financial buyers. Best’s bid was ultimately determined to be the highest and best price for substantially all of the Company’s assets. SSG’s experience running thorough Chapter 11 sale processes enabled the Company to maximize the value of the assets while preserving the business. Best is a Springfield, Virginia-based developer and manufacturer of medical equipment and supplies primarily used in the brachytherapy, health physics and radiation oncology space. The company serves customers in North America, Europe, Latin America, Africa, the Middle East and Asia. John E. Lucian of Blank Rome LLP, counsel to Best Medical International, Inc.